Shearwater, Freehold Communities‘ master-planned community in St. Johns County, was meticulously designed for modern living, from our state-of-the-art amenities to our progressive home designs. Shearwater’s homebuilders know exactly what families are looking for and incorporate the latest home trends into their designs. From home automation to flex spaces to built-in USB ports, every homebuilder at Shearwater provides unique features that were thoughtfully chosen to meet the needs of today’s families. The Coastal Cottage homes by David Weekley Homes offer beautifully functional living spaces both indoor and out. 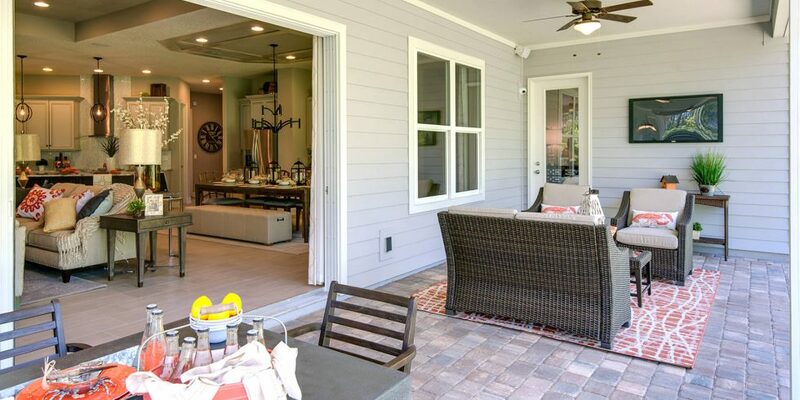 A spacious front porch and back lanai allow you to enjoy the outdoors without sacrificing the comforts of home. Relax with a glass of wine after a long day, catch up with friends on your front porch, or watch the kids play in the backyard. And no need to stress when you crank up the AC in the summertime–homes by David Weekley Homes have guaranteed maximum energy usage for heating and air conditioning through the Environments for Living program. Lennar is bringing homebuyers into the Jetsons Age of home automation with the state-of-the-art Nexia Home Intelligence System. Remote monitoring gives you the power to control your locks, lights and thermostat right from your phone, laptop or any other web-enabled device. With the Z-Wave Thermostat, control the temperature from anywhere to save on energy costs. With keyless entry, remotely unlock the front door for repair men and babysitters. Even monitor home entries so you’ll know exactly when the kids get home from school. In addition to all of the beautiful outdoor amenities available at Shearwater, bring the outdoors in with Richmond American’s Dillon floor plan. With a variety of patio options to choose from, homeowners can enjoy a basic patio, a covered patio or a large covered patio. The basic patio comes standard on the Dillon floor plan with the optional extended patio, featuring optional multi-slide doors. The multi-slide doors create a seamless transition from the patio to the great room and a convenient blend of indoor and outdoor living. Homes by MasterCraft Builder Group are truly designed for a modern way of life. Every single one of their homes includes a family foyer next to the entryway, providing a ‘stop and drop’ area that makes it easy to keep your home clean and organized, even with a hectic schedule. Drop off your purse, mail, backpacks and car keys right when you walk in the door and you’ll always know where they are when it’s time to leave. Plus, multiple built-in USB ports make dead phones and electronics a thing of the past. Although practicality is at the top of most homebuyers’ minds these days, many are also looking for ways to treat themselves. D.S. Ware Homes turn your house into your castle with luxurious, open floor plans that feature soaring 12’ ceilings and large windows that bathe the whole house in light. And after a long day, escape to your very own private oasis for a soak in the elegant free-standing tub in D.S. Ware Homes’ award-winning master bathroom. Open floor plans and outdoor living spaces are hot trends right now, but Drees Homes takes it a step further with its quadruple sliding glass doors that lead out to its spacious covered outdoor living area. The sliding glass doors let in tons of natural light and make it possible to move seamlessly from your indoor to outdoor living space. Imagine the amazing dinner parties and backyard BBQs that would be possible with doors like that! Want to learn more about the forward-looking lifestyle and home designs available at Shearwater? Join the Founders Club to always stay up-to-date with Shearwater happenings.